Many people aren’t aware of a recent technology that’s available to help with connecting that new and huge TV in the living room. They get that monster Plasma, LCD or Projector set up and realize they have a problem with needing to get a hdmi cable from the component rack and around the room to the display. Not only can this be a huge inconvenience, but unsightly wiring or major cable runs are often simply not an option. Enter Wireless HDMI. This tech is basically a wireless send and receive pair of boxes. One box plugs in to the source, usually a receiver or switching unit. The HDMI signal is then transmitted over the air to the receive box when then decodes the signal and puts it on the hdmi output at the display. Easy peesy. These aren’t cheap units though, especially if you get the higher end ones. There is a wireless hdmi site available to help you pick the right stuff for your set up, so check it out for more info. A well-reviewed BD player for under $400 is the LG BD390. The unit has great output for blu ray, and does a very good job of upscaling DVDs. Also included is an 802.11n wi-fi connection for BD-Live streaming and quick and easy firmware updates. Disk load times are fast, at 26 seconds total load time. So, with the wifi, disk load speed and quality upscaling, the BD390 is nothing to be blue about. This new LED LCD model, 55 inches of goodness, made by Lucky Goldstar, is definitely a top contender in its weight class. Been sitting on the fence on LED LCD? Might be time to hop on over and check out the LG 55LH90. This unit uses a Super-In Plane Switching (S-IPS) LCD panel, which is the best LCD tech currently available. Owners of this set have claimed absolutely stunning picture clarity, deep and true blacks, and just gorgeous picture overall. The black levels on this unit are improved with a new local dimming feature. What this does is show you darker scenes with improved clarity. Also, with a 240 Hz refresh rate, motion blur is a thing of the past. Compare to the typical 120 Hz rate. Let’s see the Jones’ try to keep up with this one. I see lots of requests for good HD projectors under a grand, and one exceptionally good choice is currently the Panason PT-AX200U. This unit is an LCD projector with 1280x720p resolution. It has a 2:1 manual zoom/focus lens with manual H/V lens shift. She throws a 100″ diagonal 16:9 image from 9.9′ to 20.3′ back. This unit throws a great image, and with the horizontal and vertical lens shift, placement is very versatile. 1080p stuff just looks great. In this is your budget and HT projection is your fix, don’t miss this model for consideration. I’ve heard people ask why would they want a projector over an LCD or Plasma display. The short answer is: Size. You can easily have a 90-120 inch screen in your home, ultimately providing your own theater experience. This does come with a few trade-offs, however. The setup, maintenance and controls are more involved on a projector and the viewing environment needs to be different. For example, your grandmother probably doesn’t want to sit in a darkened room or care to know how to select the correct input, aspect ratio, and adjustment preset on the PJ while matching output on your switcher/receiver/pre-pro setup. She just wants to flip the thing on and watch some Golden Girls, yer? There’s just something about watching and 8-10′, yes that’s FEET, screen in HD. Watching movies, TV series, and sporting events in glorious HD at this size is something grand you can’t just put into words and do the experience justice. I am just not interested in anything less anymore. I have some nice Sony units in my home (30-32″) that just don’t get used. I literally haven’t turned my main smaller unit on in months. If I’m going to take the time to watch something, fire up that HD DLP projector and I’m immersed in the world that is presented. So, if you hate settings and tinkering for best picture, etc. you may be happy with a Plasma/LCD for the ease of use. But, for a fraction of the cost, you should be aware that you can have your own movie house in your home. If you’re not the do-it-yourself kind of person for technical or electronic equipment, consider paying someone to set it up and teach you how to use it. You won’t be sorry. 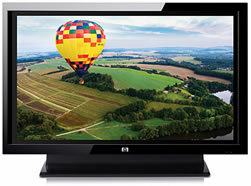 Today one of the big questions in Home Theater, is which is better LCD or Plasma technology? Let’s have a quick rundown of the positives and negatives of each technology, then I’ll give you hard and fast recommendations. Typically have had motion blur issues, though newer models are less susceptible. More expensive than plasma, but prices have leveled well, except for the largest screens. Usually have a matte finish screen which reduces glare and reflections. Use less power, typically 25-30% less than plasma. Often claim longer life spans. 60,000 hours anyone? Glossy finish, which some like due to perceived increased image clarity. Often these sets have superior images to LCD, however some purists claim the image is overblown. Typically have better viewing angles, but newer LCD models are overcoming this. So where does that leave you? It depends on which features matter the most. Glossy screens may be a deal breaker if you have a lot of light in your viewing room, or image burn-in may be a problem for heavy gamers, for example. LCD vs Plasma in general though, the image-bang-for-your-buck factor depends on which size you want. If you’re looking for one of the larger sizes, such as 50-inch or larger, Plasma will get you more for your money. Smaller sizes are much closer in price, and you’ll need to consider the various trade-offs. Be wary of viewing screens in local retailers for your decision-making process – these sets are usually not calibrated. A 30-minute calibration that you can do yourself may make all the difference. 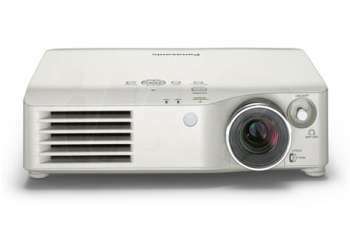 Optoma have brought us our first 1080p DLP projector under three grand, and this beaut is now available in local stores. Seen as low as under $2500, the maximum HD resolution for truly big screen viewing is more affordable than ever for DLP. After spent a few hours playing with HD80 last night, all I can say is this is one hell of a projector! Highly recommended to anyone whose looking for a best image quality at a lowest possible price. It is a very nice machine, I think almost everyone would be happy with it. the picture is just gorgeous with great blacks. It looks good with minor adjustments. I’d recommend the HD80 to anyone looking for a powerful projector with high resolution. Right now I’d say this is the 1080p DLP to get. I’d expect this PJ to be a huge seller for the videophile looking for a lower priced deal market. I was quite impressed. It was VERY bright and VERY sharp. I didn’t notice anything wrong with the colour. It was well saturated, and primaries and secondaries seemed to be in the right place. I am still looking for an in-depth pro review, as I don’t have my hands on one of these units yet, so stay tuned. Pioneer’s new 8th generation plasmas are upon us, and it looks like these babies will delight. The wonderful blokes over at HDTV Test have an excellent review of this piece, and they have found it to be superb. 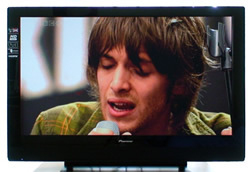 The reviewer sums up by saying this is the best flat panel he’s ever checked out. – Generous connectivity: 3 HDMI ports, 3 Scarts, optical audio out, etc. Awesome blacks? Check. Enormous dynamic range? Check. D65 greyscale? Check. Saturated but not overblown colours without hue and decoding errors? Check. Smooth as a baby’s bottom 24fps handling? Check. Top-notch video processing? Check. No image retention, screen uniformity issues nor posterization? All check. Pioneer have a winner on their hands in the form of the PDP4280XD… I’ve even seriously considered keeping it as a point of reference for all my future reviews. It looks like this new plasma could be the new king. 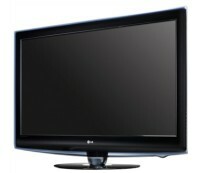 Looking for a value priced plasma TV in the 42 inch size range? Check this unit out. This unit has a great picture for this price range, and is a worthy plasma contender. The HP PL4272N is an excellent buy. Yes, you can do better by spending several hundred, or several thousand, additional dollars. But for solid performance at a price that will please your wallet, take a close look at this one. Toshiba have recently released a new HD DVD player, the HD-A20 model. This model is similar to the lower priced HD-A2 model, but adds true 1080p functionality. What has been found, though, is the 1080p output is not really worth the price of admission. Unless this player’s firmware is updated with 1080p/24 output, or your display has poor 1080i deinterlacing, keep your cash and get the HD-A2. All contents copyright © Home Theater Dude. All rights reserved.